At first glance I thought that our buggy sign here in Newport (Herkimer County), New York, was just like the one in Michigan but then I noticed that the horse’s tail is much longer and the horse must make a lot of decisions on his own because there are no reins. I don’t live very far from Herkimer and my girlfriend and I plan on doing some shopping in the Little Falls Herkimer area. I will have to take a look see at the buggy signs. 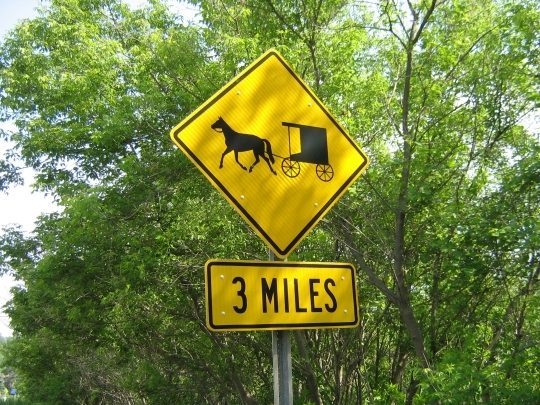 Where are the most Amish buggy accidents? Good question Richard, and one that would probably take some research. Have there been any comprehensive studies done comparing the states’ Amish buggy accident rates? I don’t think so, so I don’t think anyone can answer that definitively. There have been buggy safety studies done in individual states, for instance Ohio. I think there are 2 ways to look at it. Those high-population Amish communities (either high Amish or both high Amish and English, like Lancaster) might have more cars and buggies on the road (theoretically more chances for an accident). But people’s awareness levels are likely higher, since they are either used to driving with buggies (locals) or in the case of tourist visitors, going to an Amish area they know to expect buggies on the road (however, this doesn’t mean driving habits of locals or tourists are necessarily safe, but that’s another topic). The smaller communities may have fewer buggies and therefore fewer chances to hit one, but awareness and expectation of horse-drawn vehicles on the road is probably lower. So on a per-capita basis, one or two incidents in a small Amish community may result in a higher accident rate than a place like Lancaster or northern Indiana, where they seem to happen frequently. That’s my 2 cents anyway. What do you think? Road signs throughout the U.S. are regulated by the “Manual of Uniform Traffic Control Devices” (MUTCD). Though it’s existed for something like 60 years, it seems in the last 15 years the Federal Highway Administration has really pushed for it be followed much more uniformly especially on town roads and with unusual signs. They also like to re-design things — I’m certain somewhere there’s an engineering report filed in Washington explaining how by removing the reigns they increased how quickly people recognize the sign. Not sure when the change was made, at least as far back as 2003. But like I said FWHA has been “cracking down” and wanting to make sure states, towns, counties all follow the manual for new signs in exchange for their Federal road aid money. Back in the 90s FWHA would’ve grumbled but not forced towns to put up the right signs. Matt, very interesting and not totally surprising. There really is quite a variety of signs in different states. Of course I find this very interesting but wonder if a one-size-fits-all solution is necessary or even wise. I do wonder to what degree any differences would really affect recognition and safety, if at all–after all the various designs aren’t radically different in what they depict–a horse and a wheeled vehicle of some shape. I also notice there’s no open-top buggy in the official federal list of signs. Maybe they should make that dispensation for the Swiss Amish communities. I wonder if we’ll see a crack down on this as a future Amish-related controversy. I have a question on mandated insurance. Are the Amish required to have insurance on their horse and buggies while on the road? I ask this because my insurance agent could not answer that. I’ve never heard of such a requirement. In one way it’s similar to walking or riding a bicycle; no license or insurance is needed. Doesn’t mean you’re not liable, just you’re not required to be insured. How much damage can a horse & buggy do to the property of another relative to an automobile? For farm tractors and implements, you would be covered under the farm’s commercial policy (granted the Amish wouldn’t carry such insurance). In my state, and I believe most, if your dog is hit by a car on the road and the car is damaged — you’re liable, and your homeowners insurance will cover it. Now livestock is often different, especially in “open range” states that still exist or areas thereof where livestock are allowed to roam free. How ridiculously low most state insurance minimums are is another story! Too bad we can’t have other signs pointing to the “reality” of what you might encounter on roads in both Amish & English areas of the country…like “Multiple Tavern Zone” (warning of the possibility of many impaired drivers)—maybe an overflowing beer mug superimposed on a car wreck? Or “Warning! New Drivers!” around high schools (driver’s ed), showing shiny new car keys on a keychain. The possibilities are endless 🙂 ! Here we have the usual “deer” crossing warning sign, and a number of “horse trail” signs, as well. In my daughter’s area a few miles from here, there’s a “turtle crossing” sign, and in another town, the duck with a line of ducklings following, for “duck crossing.” I believe “armadillo crossing” signs can be found out West. What’s the most unusual “crossing” sign anyone’s seen? Well said Alice Mary. On balance I think we can get “oversigned” pretty quickly but some of your ideas might make real sense! “Bar Zone Ahead–Avoid Fri/Sat PM”. For me I think the duck sign is the most unusual and enjoyable sign I’ve seen. I like the snowmobile crossing signs as well. I think there have to be some weird ones out there, flamingos in Florida maybe? Bears out West? I have a buggy and horse that I drive on lazy Sunday afternoons. Because there are no Amish in the local area I approached our Township board and asked permission to place a buggy sign on my road. More or less for the public to be made aware that I am in the area. I received permission from the board and placed my two hand-painted signs (that I painted because I also do barn quilts) on the North end of the road and on the South end of the road near a cemetary. Near Halloween one of the signs was stolen. The one by the cemetary of course. I called the local sheriffs office and placed a claim of a stolen buggy sign. The poor deputy had no idea what a buggy sign was to which I had to explain. In the meantime, I have painted two new signs. The farmers stated they liked the signs because it slows down traffic on our busy road. I am surprised by the variety of signs and will be more observant in the future. Linda you are a rare example of a non-Amish buggy driver leading the charge for horse-drawn road safety! Loved the story though sorry to hear you have trouble getting signs to stay put. Thank you, Matt, for the link to the road sign pictures. Growing up the Ontario Ministry of Transportation sign that most made me giggle was the “The bridge ahead lifts or swings to let boats pass” sign, it actually looks like an angry face loosing its top.